French-headquartered aluminium boat designer/manufacturer ODC Marine established its shipyard wing in Dalian, China, in 2006. Focusing on small-to-medium-sized work boats, fishing boats and passenger craft, the company has developed, innovative propulsion solutions that utilise lithium battery-powered electric and hybrid-electric technology. In 2009, ODC Marine delivered its first passenger craft with a 100 per cent electric lithium propulsion system. With capacity for 50 passengers and a six-hour runtime at six knots, the vessel presented significant environmental benefits through low emissions and greatly reduced noise. In 2011, ODC delivered a second, more advanced electric vessel, able to reach 11 knots and powered by two 75kW electric motors and a 300kW/h lithium battery pack. Leveraging this developing expertise with hybrid technology, the shipyard is now shipping its first hybrid diesel-electric passenger craft. Equipped with two 300kW diesel engines and two 75kW electric motors, these vessels can reach a maximum speed of 20 knots (when under diesel power) and offer two hours of autonomous run time at six knots with the electric propulsion. The proof-of-concept vessel was designed by naval architect Eric Jean and engineered by ODC, with extensive sea trialling performed at the Dalian shipyard site. During trials, the shipbuilder noted the vessel’s penchant for smooth and silent manoeuvring whilst in harbour. Now utilising this hybrid technology for commercial sales, ODC’s passenger craft are able to reach remote locations swiftly under diesel power, and then are free to explore environmentally sensitive or protected areas without risk of pollution, emissions or noise. 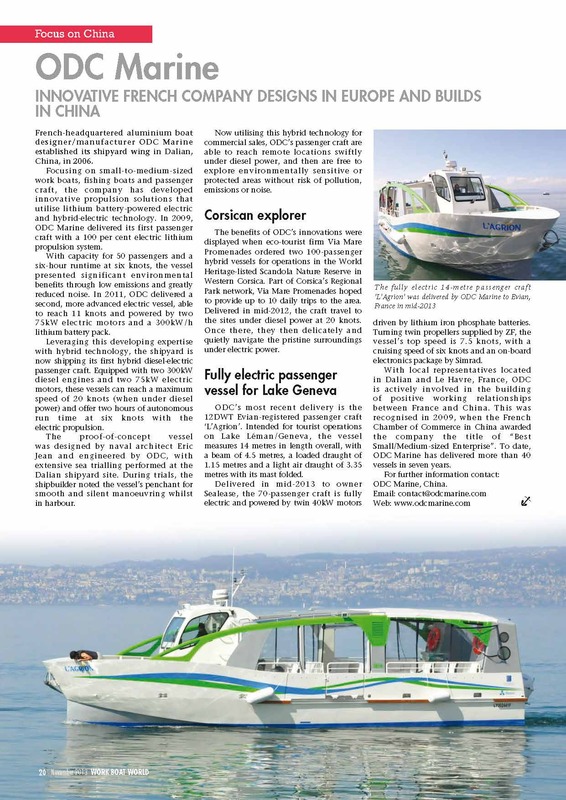 Corsican explorer The benefits of ODC’s innovations were displayed when eco-tourist firm Via Mare Promenades ordered two 100-passenger hybrid vessels for operations in the World Heritage-listed Scandola Nature Reserve in Western Corsica. Part of Corsica’s Regional Park network, Via Mare Promenades hoped to provide up to 10 daily trips to the area. Delivered in mid-2012, the craft travel to the sites under diesel power at 20 knots. Once there, they then delicately and quietly navigate the pristine surroundings under electric power. Fully electric passenger vessel for Lake Geneva ODC’s most recent delivery is the 12DWT Evian-registered passenger craft ‘L’Agrion’. Intended for tourist operations on Lake Léman/Geneva, the vessel measures 14 metres in length overall, with a beam of 4.5 metres, a loaded draught of 1.15 metres and a light air draught of 3.35 metres with its mast folded. Delivered in mid-2013 to owner Sealease, the 70-passenger craft is fully electric and powered by twin 40kW motors driven by lithium iron phosphate batteries. Turning twin propellers supplied by ZF, the vessel’s top speed is 7.5 knots, with a cruising speed of six knots and an on-board electronics package by Simrad. With local representatives located in Dalian and Le Havre, France, ODC is actively involved in the building of positive working relationships between France and China. This was recognised in 2009, when the French Chamber of Commerce in China awarded the company the title of “Best Small/Medium-sized Enterprise”. To date, ODC Marine has delivered more than 40.